Let me tell you it's as easy as just knowing how. Everything's easy once you know how, right?! In this 2 part video, I show you exactly the steps to take to have a beginner playing with the correct embouchure, a good tone, and proper use of air. "Quick fix through proper technique"
That's my new catch-phrase, and I freaking love it. When you know how to set up a student's embouchure correctly, they'll be set for the rest of their lessons with you. You'll never need to try and "fix" their embouchure again, because it's perfect from the start. 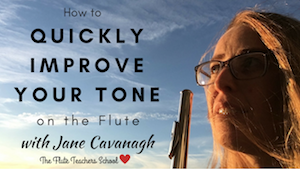 If you want more "quick fixes", be sure to sign up for the free course "How to Quickly Improve Your Tone on the Flute". Proper flute technique, explained clearly, is like a magical quick fix!